A world first will be taking place this month when a full week of African documentary films are broadcast across sub-Saharan Africa on DStv channel ED (channel 190) and GOtv (channel 65), from the Durban International Film Festival, the largest film festival in South Africa that takes place from 17 to 27 July. So many documentary films have been shot in Africa, but very few have been seen by African audiences. This heralds a new era of distribution for the continent. ~ says AfriDocs Executive Producer Don Edkins from Steps in Cape Town. Rebecca Lichtenfeld, Director of Social Impact Media at Bertha Philanthropies, said that the Bertha Foundation is proud to partner with Steps to help bring great documentary films to audiences across Africa. Connecting documentary film to African audiences is something we have been hoping to do for some time now, and this is an ideal platform for that. Use this online tv schedule at www.afridocs.net/tv-schedule. 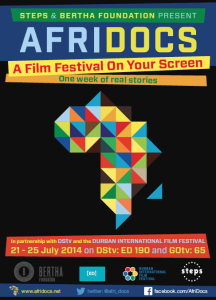 Download the AfriDocs DIFF 2014 TV Schedule PDF (406 KB). Follow us on Facebook at www.facebook.com/AfriDocs.